The Dementia and Severe Behaviour Supplement (Australian aged care funding) can be used by aged care organisations in Australia to improve staff skills, and you can do this by enrolling in the Diploma of Dementia Care Leadership. This nationally recognised qualification is for leaders and those who are in roles that require leadership and who feel they need to learn how to be a better leader and to know more about modern dementia care. McCarthy Learning has developed a Diploma of Dementia Care Leadership which is to be launched with our first intake this July 2014. Let’s face it, most undergrad courses or entry level courses do not prepare you with adequate knowledge about dementia – most of you have probably learned what you know on-the-job. Now is the time to consider a professional training program that is designed to be practical and give you the knowledge you need to be an excellent leader and have the most up-to-date knowledge of best practice dementia care. The Dementia and Severe Behaviour Supplement provides $5,894.75 for each eligible resident. If your organisation is receiving this supplement for some of your residents suggest to your manager that they support you to improve your leadership skills by enrolling you in the Diploma of Dementia Care Leadership. The course is delivered in six blocks of face-to-face learning for 3-5 days every two months for a year, with online learning and workplace projects. Cost of the course this year is $7,000. Next year the cost will increase to our usual price of $9,000. Offered in all capital cities of Australia. Happy Mother’s Day to all the mothers with dementia in Australia today who are anxious about their children, who believe they have to be home with their children, who cannot remember their children’s names or faces anymore, who cannot remember their husband’s name, who become upset when they are reminded that they are mothers because they realise they have forgotten, who are anxious because they think there is something they have forgotten to do, who think they are young and need their own mothers. Happy Mother’s Day to you and to those wonderful people who care for you. This short video is a good introduction to responsive behaviour. We used to call it ‘difficult’ or ‘disturbed’ or ‘challenging’. Responsive is a much better term that captures the fact that the person with dementia (just as you and I do) respond ti stimuli in our environment or from within ourselves that cause us to act. So in that sense the person with dementia is no different to you and me. “If we observe them closely, we notice that they do not listen to the answers given to them but simply keep repeating the questions. What seems to be an eager curiosity is in reality a means of keeping a person they need near at hand” – Maria Montessori 1914. Maria Montessori was talking about children. However, this is equally true of older people living with dementia whose memory difficulties and problem solving makes them insecure and uncertain. And so they seek out attachment figures who make them feel secure and safe, calm the uncertainty and anxiety that memory loss provokes. ageism in Australia. The human rights perspective has not been brought to bear on ageing much to date and this is especially true of aged care. Several things struck me about his presentation. Firstly he spoke of “rights holders” and “duty bearers”. The older person is the rights holder and we are the duty bearers who have a duty to uphold or protect the person who holds the right. It made me think of the situation I have face in the past when families and others overwhelm the older person and essentially cajole them into going into aged care. This is a failure of our duty to uphold their right to agency, to choice. Even cognitive impairment does not take away a person’s right to agency, choice. The other point he made was that we have difficulty with empathy for older people (and this especially true of our relationships with older people with dementia) and we “other ” them. We make them into an “other” who is different, not like “us”. Kitwood referred to the work of Martin Buber who spoke of an “I” “Thou” relationship in which the other person is not made into something different but is recognized as a subject, a person like me. However, when we engage in “othering” we have difficulty with empathy, with recognizing elements of our own experience in the other person treat the person who is old, who has dementia as if they are not like us, have little in common with us, are essentially different to us. I remember coming to grips with this problem in myself some years ago when I realised that I could not picture these older people as once young, once like me, smooth of face and strong of limb. I concentrated on trying to make this connection and it helped me to engage with the older person as a person with outlooks, perspectives, experiences and feelings like mine, hopes like mine. Simon Biggs said that empathy is the antidote to othering. What do you think? Talking with a group of carers of people living with dementia today. Ordinary people faced with a journey of up to a decade of struggle with difficulty that they did not volunteer for or expect. Most taken by those facing support of a spouse with early onset dementia – young ones at home, Dad behaving oddly, workmates noticing, finally his golfing partner and doctor coaxes him to come for an assessment. Now they have a name for the oddness and can sort out what the next decade or more will hold. Plans for retirement and dreams of an old age together are ashes in her mind. They want to know how to deal with the lack of motivation, the refusal to shower, the odd eating habits that are so new and confusing for the children. They are teenagers and don’t understand why Dad is embarrassing them more than usual. he seems oblivious. He is unaware that his behaviour has caused a seismic event in the lives of his wife and children. And he cannot help them for the first time in his life when they need him the most. She is relieved when I say its OK to let him sit if that is what he wants. Make sure he has a balance of exercise and rest but don’t impose activity on him when all he wants to do is sit. His amotivation is causing him to sit and be difficult to get going,resistant to her urgings to talk, to walk, to go out together. She knows it would be good form him but her efforts are exhausting her. Now she can let him sit if that is what he wants to do. Its a matter of balance and not imposing her ideas of what he should be doing when all it does is create distress for her and resistance in him. Another has a husband how goes to the post box and the back gate several times a day. Is he unsafe? Is she worried about him? Not now but it used to make her mad angry with him. Now its OK.
One won’t have a shower. Is he incontinent? or does he smell? or is his skin breaking down? If not then consider not pushing him to have a daily shower. Maybe change his clothes each day and check his skin if possible as you go. But don’t push the issue. Pick your battles. The goal is hygiene, so think about a way to achieve that . Maybe a basin wash or one of the newer chemical solutions that mean he doesn’t have to have water on his skin if that is what he doesn’t like. If the issue is physical safety then you need to act. ie. If the person is walking into traffic or about to use a knife or machinery unsafely you have to intervene. But if it is not that urgent, be strategic and pull back, let the moment pass and think coolly about it. Perhaps talk to someone else about it. And then respond. I hope some of this helps. Most of this comes from their collective wisdom. If oyu have ideas yourself please share them here. Dogs and cats have been used in modern dementia care with excellent results of improved levels of agitation and engagement. Despite concerns among some staff that they might cause infections or be dirty and need to be cleaning up after them, animal assisted therapy has become a core part of most dementia care settings. Some dementia care homes have a “live in” animal who lives with the residents and is very much part of the furniture. This is usually a cat whose presence is quiet and gentle. Cats have even been noted to choose to sleep on the bed of residents who are close to death, becoming a local signal for increased palliative care as end-of-life approaches. This is sometimes interpreted as a comforting presence and many cats are maintained in dementia care environments with great affection. The Eden Alternative makes explicit their emphasis in having animals as a core part of daily life. Local aged care homes in Melbourne that embrace the Eden philosophy have been known to have visiting donkeys, goats and other farm animals. These visits have caused great delight and much talk for days after the event. 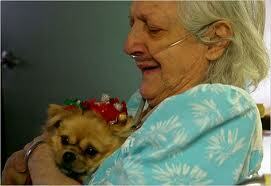 Animals large and small can be integrated into the life and rhythms of an aged care home. This should be moreso in regions where animals were a part of every day life such as country aged care homes. But is it necessary to have a live animal? Can’t you just have a stuffed toy? Or a robot? A study in 2009 examined the effectiveness of a live dog versus a robotic “pet”. 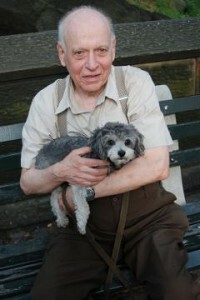 They compared the effect of a person, a person accompanied by a live dog, and a person accompanied by an AIBO (Sony’s computerised robotic “pet”), on behavioural indicators of social interaction among female nursing home residents with dementia. All three types of visits stimulated residents to initiate conversation, touches, and looks at other individuals (human, dog, and AIBO) and provided contacts with the outside world. Both the live dog and AIBO stimulated resident social interaction beyond that stimulated by the visitor alone. The AIBO induced longer looks and more resident-initiated conversation than the live dog and provided a positive source of social interaction. While all three types of visits stimulated nursing home resident social interaction, the success of the robotic dog in stimulating social interaction by dementia residents suggests that it may provide a viable alternative to live animal visitations. Somehow though there is something more pleasing and satisfying in terms of an ongoing relationship with a real animal, particularly with a dog. Other animals provide pleasure and stimulation simply by being there for brief periods and if that is possible in your home it it likely to have real benefits to the residents. There are organisations such as Delta Pet Partners and Lead the Way that will provide trained animals and trainer owners to come to your aged care home for visits that can be safe and enjoyable for all. So no matter if it is for a short time or a long term arrangement, having access to animals should be seen as a normal part of life in an aged care home for people living with dementia. We have no commercial connection with either of the groups below but they may be able to help you find more information and resources.